WASHINGTON PARK — The Black Lives Matter event held in Washington Park Sunday didn't look like many of the police protests the city has become accustomed to this year. The day was dedicated to the memory of Ronald Johnson, who was shot and killed by police a week before Laquan McDonald's death in 2014. But instead of marches, chants or sit-ins, the park was filled with music, face paint and barbecue smoke. The summertime gathering was convened as a way to "reclaim the space" where Johnson was killed, said Black Lives Matter organizer Aislinn Pulley, who helped put the festivities together. The upbeat atmosphere, she said, was their way of unifying around that cause. "The ways in which we've resisted violence...are multitude," Pulley said. "They include organized resistance in the forms of marches, and they include organized resistance in the form of reaffirming our love for one another. And that's what we're doing here today." At least a half-dozen community and social justice groups tacked onto the event, billed "Ronnieman Day" for Johnson's nickname. Ujimaa Medics held a first-aid seminar on how to treat people for gunshot trauma. A staffer from the Chicago Childcare Collective painted children's faces, including those of Johnson's young daughters. Groups like the Let Us Breathe Collective and Assata's Daughters were also heavily represented, mingling with kids as they ran between craft stands and a bounce castle. Last December, Cook County State's Attorney Anita Alvarez announced that no charges would be brought against Officer George Hernandez, who shot Johnson twice as he ran in the opposite direction. Alvarez's office released dashcam footage they said showed Johnson carrying a gun while he ran. Johnson's mother, Dorothy Holmes, resolved to get the case reopened as she stood at the site of her son's death near the intersection of 53rd Street and King Drive on Sunday. In the meantime, she said, her mission is to see that section of Washington Park renamed in her son's honor. "I just want people to know that my son was a good person, and what happened to him was wrong," Holmes said. "I just hope it brings some peace and unity to everyone else who's lost someone." Holmes said she hasn't yet spoken to any city officials about making the name change official, but she hopes to see it become a reality by next year. But the hundred-or-so attendees of "Ronnieman Day" didn't wait for the city's blessing. 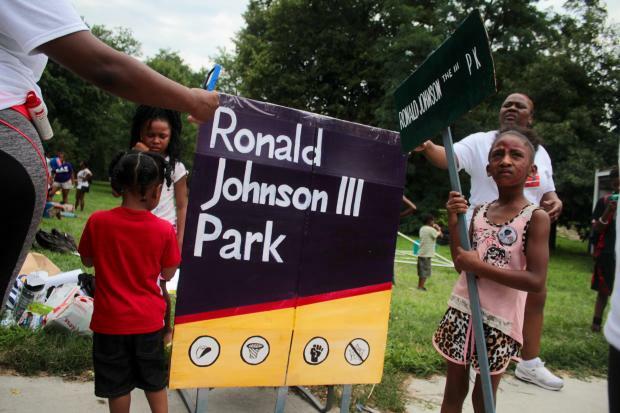 The For The People Artists Collective brought a full-size placard reading "Ronald Johnson III Park," painted to look like it had been printed by the Chicago Park District. Johnson's name wasn't the only one to be raised at the event Sunday. About 100 tiny white flags swarmed the outskirts of the park, all bearing the names of young people whose lives had ended violently. Some of them, but not all, had been shot by police, Holmes said. But the gathering, festive as it was, was still unmistakably a stand against police. One of the participating groups, after all, had held a rally in that same spot a week earlier calling to stop funding the police department entirely. And over on the West Side, activists representing some of the same groups were three days into their encampment protest outside the Homan Square police facility Sunday. But with shootings surging across this city this year, participants made it clear that they were collaborating to put an end to every kind of violence. And to Ronald Johnson's sister, Billie Johnson, police are only pushing that goal further from reach. "We need to come together as a black community, to stop the violence coming from police, and to stop the black-on-black crime," Johnson said. "Because [police] are supposed to be protecting us, but now instead we have to come together to protect ourselves from them."